This is one of the first recipes I learned to cook. I was freshly out of my parents' home, out of my country, far away from even the whole European continent: I was a newly enrolled graduate student in the United States. A week or two after landing on the American continent, I started craving for Romanian food. And boy, was it hard to find those delicacies in the area my school was in. I started asking my mom for easy recipes over the phone and over email, and this is one of the first she shared with me. I did not know anything about cooking rice at that time. At the same time, my mom forgot to warn me that it grows in size tremendously: I guess that's something everyone should know, though I didn't. I was really excited to finally have some food from back home. So, I eyed the quantities for each ingredient in her recipe (slightly different from the one I detailed here), and I filled the pot with the ingredients (including the uncooked rice). And the rice started growing, to my great surprise. One pot of pilaf soon became two, then three. The dish tasted great in the end, just like it did back home. But I had so much of it in such a short time: I ate it for both lunch and dinner, most days, for the next week or so. As such, I really had enough of that taste, and I did not want to see it in front of me for a long time. It's been 15 years, and I finally craved for this dish again. And, as I prepared it, I thought I'd share the recipe with you as well. Hope you give it a try, and if you do, I hope you remember that rice triples in size when cooked. Before I delve into the recipe, let me also mention that I consider this to be a difficult dish to prepare. The reason is that I like recipes that are more hands-off, where you can leave stuff in the oven or on the stove and not pay much attention to them (for example, I once started preparing the Fall-Off-The-Bone Baby Back Ribs, then I headed to the beach for a few hours of volleyball, only to come home and find the dish almost ready for eating). The rice pilaf takes significantly less time, but it requires one to watch it carefully, and to promptly remove it from heat when ready. The reason for this is that if you keep the rice cooking further, it absorbs more and more moist, it looses texture, and it ends up as a mush. - Preheat the oven to broil or highest heat available; we will need this for the final step. - Finely chop the onion, bell pepper, carrot, squash, and tomato. Also finely chop the parsley, but save separately for later. - Place the oil (or melt the butter) in a pan, add the chicken drumsticks, and cook on low heat until the chicken changes color (about five minutes). Add the chopped onion, bell pepper, carrot, squash, and spices (salt and pepper) to taste. Cook for another 5 minutes. Add the diced tomatoes, and set aside. 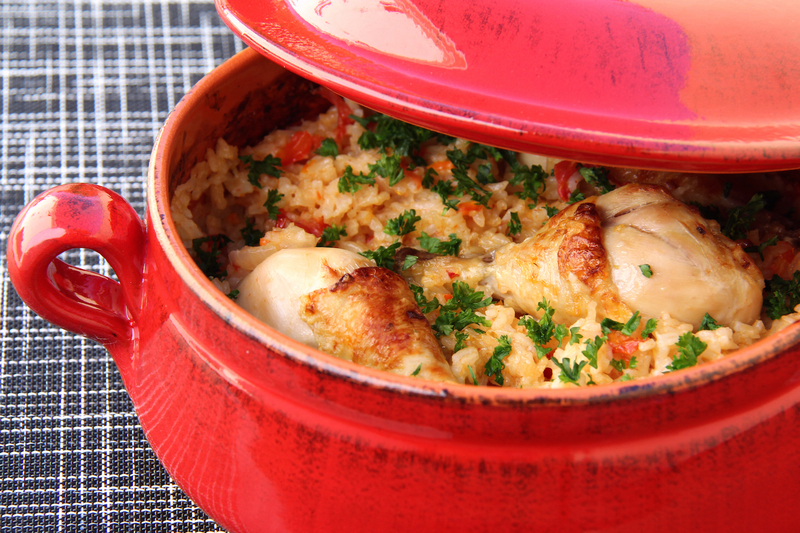 - Place the wine in a pot, add the rice, and cook on low heat for 5 minutes. Only stir gently and occasionally to make sure the rice does not stick to the bottom. - Add the chicken broth over the rice, together with the chicken and the vegetables (also, transfer the oil they were cooked in, as well as any juices there might be: they all help make the recipe flavorful and smooth). Add also most of the chopped parsley (keep a bit for the end). Mix gently. Continue cooking on low heat for another 10 minutes. Try a bit of rice, and cook for a few extra minutes if it still feels undercooked. - Make sure the pieces of chicken are at the top. Transfer the dish to the preheated oven, and cook until the chicken gets a nice crust and a beautiful color to the top of the dish. When ready, remove from heat, cover, and let sit for 15 minutes. This final step allows the rice to become more moist and flavorful. - Use a fork to gently fluff up the rice. Then sprinkle the final bit of chopped parsley on top, for extra color. - The dish looks great in and of itself: an ocean of white rice, with occasional colorful accents from the red bell pepper, carrot, tomatoes, and parsley. - If you managed to brown the chicken a bit as well, the presentation should be perfect. this dish look different and yummm i tried this many time! !